Eliminate Dull Skin with Tomatoes. Tomatoes other than used for food ingredients also have many benefits for your skin health. 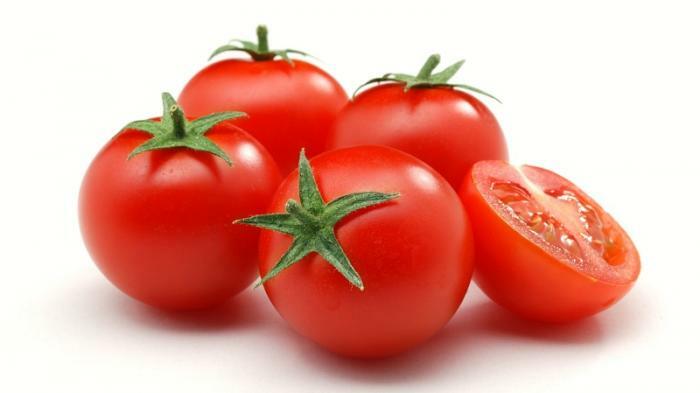 Tomato fruit has a freshness and red color, this fruit is often used for skin health and beauty. Tomatoes have the ability to remove dull skin. Tomatoes are a lot of food in the kitchen. In general, the famous tomatoes as a complement to fresh foods and drinks. Usefulness of tomatoes in addition to good for health, is also good for beauty. Many believe that tomatoes can reduce the pores, treat acne, and remove the dull skin. The content of lycopene in tomatoes is a useful antioxidant substance from the inside as a sunscreen. Antioxidant content is useful to help reduce damage to cells and skin that looks reddish. For ideally, it is recommended in one day to each person to get lycopene at least 16 mg, it is useful to reduce free radical levels in the body and helps skin moisture caused by exposure to air conditioning. Tomato fruit has a useful acidity to reduce and help eliminate acne. Most acne medications contain vitamin A and vitamin C, and these vitamins are also present in tomatoes. Tomatoes are rich in vitamins A, C and K. If you have mild acne, just stick a piece of fresh tomatoes on the face of acne. Allow about an hour, then rinse with clean water. In order for your acne to dry quickly, do this treatment regularly and if necessary do as often as possible. If your face has excess oil, make tomatoes your solution. Take fresh tomatoes and puree, then strain. Add cucumber juice with the tomato juice you've made. Use a cotton swab to smear into the face. In addition to this herb is useful to absorb excess oil, is also very helpful to prevent acne. Large pores are more at risk for impurities, so the possibility of infection in the pores will be greater. How to treatment, make a fresh tomato juice and then take a tablespoon. Then add a drop of lemon juice between 2-4 drops. Put the concoction using a cotton ball on the face, then do massage with the direction of circular motion. Let it take about 15 minutes, then rinse with cold water. to get better results, use the potion regularly. The technique is very effective to shrink the skin pores. A good combination for making facial masks is a combination of tomatoes and avocados. How tomatoes work can inhibit the presence of blackheads and reduce the amount of excess oil. And for avocado has an antiseptic effect and is also useful for moisturizing. This combination of masks is very rich in vitamin A, vitamin C and vitamin E which helps to soothe and also cleanse the skin. Wear the mask about 20 to 30 months, then rinse it with warm water. The cause of burning and inflamed skin is exposure to UV rays. How to fix this, mix 2 tablespoons of yogurt with tomatoes that have been mashed. How to use, apply the ingredients in hands, feet, neck and face about 20 minutes and do rinsing using clean water. The function of tomatoes to neutralize the surface and also cool the skin, and for yoghurt plays a role to nourish the protein needed by the skin that will make the skin becomes supple and soft. According to the USDA in 100 grams of tomatoes, the largest content in it is vitamin A 17% and vitamin C 21%, the rest are fiber, protein, calories, sugar, calcium and iron. The content of vitamin C is great it turns out to bring more benefits for the body. In addition to maintaining the body's immune system, vitamin C can also act as a skin lightening agent. Not satisfied just there, there are still some tomato benefits as described below. Indeed tomatoes are not able to shrink pores instantly, but he can clean the pores that carry dirt and replace it with beneficial nutrients. When the pores do not carry dirt, the pore size will automatically shrink. The face also looks more smooth and soft. Mix tomato that has been smoothed with 1 tablespoon lemon juice, add 1 tsp sugar and then massage the face gently. Be careful, because if dimassage is too hard, sugar can hurt the skin. Let stand for 15 minutes, then rinse with warm water and end with cold water. Acids contained by tomatoes are able to accelerate the healing of acne. Vitamin A and C will also treat acne scars, moisturize the skin, as well as brighten the skin. Mask the mashed tomatoes, spread them all over the face and let stand for 1 hour. Rinse with warm water and finish with cold water. By doing this step at least 2 times a week, acne will recover faster. Using a whitening cream / lotion, you will not get radiant bright skin naturally. And at some point in time, your skin will again look dull. However, tomatoes will make your skin look brighter shine naturally every day. Simply by consuming and wearing it as a mask. If beautiful can be obtained without expensive ways, why delay it again?